In the 1950's, various ethnic police and fire organizations were already in existence in New Jersey. Although Irish Americans had traditionally been one of the largest ethnic groups in the public safety field, they had no such organization and the desirability of having one was increasingly apparent. Finally, in 1958, with the late Sgt. Vince McDonald and Ptl. Pat Brennan of the West Orange Police Dept. as the prime movers, a notice was placed in local newspapers. Interested Irish American law enforcement officers and firefighters from the various departments in the county were invited to attend a meeting in West Orange for the purpose of forming the organization. 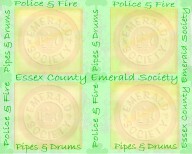 The response was overwhelming, nearly every department in the county was represented and the Essex County Emerald Society came into being.